"A Statue of Nikola Tesla in the Silicon Valley"
Video of "A Statue of Nikola Tesla in the Silicon Valley" unveiling ceremony. Photo of Dorrian Porter of Northern Imagination speaking at the unveiling courtesy of Scott Kline Photography. 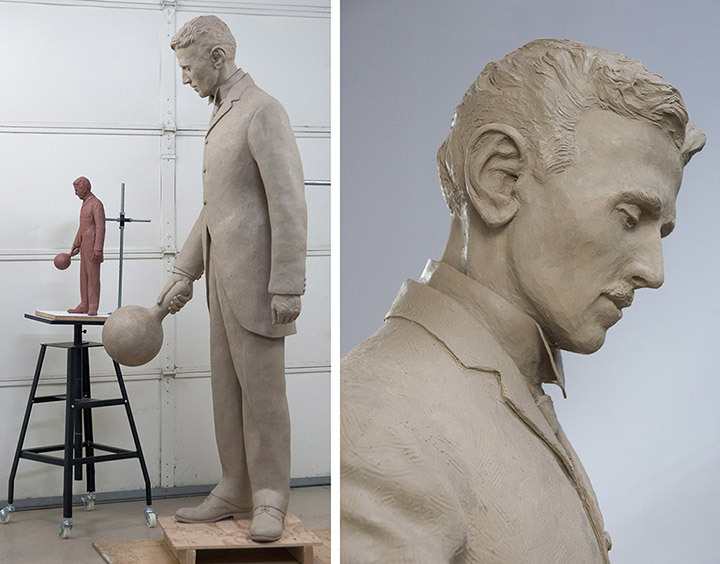 I was thrilled to have been commissioned by Northern Imagination to create a seven-foot bronze statue to honor Nikola Tesla, a man I had admired for many years. The statue to be installed in the land of inventors: Silicon Valley, California. 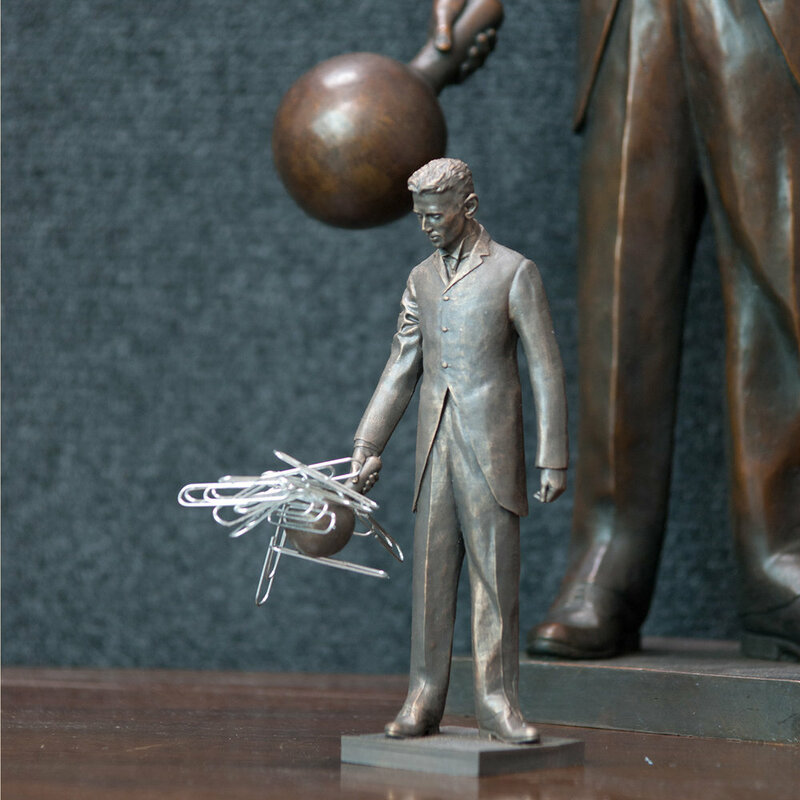 Funding for the full-sized statue was successfully raised throughout the month of May, 2013 with a Kickstarter campaign: "A Statue of Nikola Tesla in the Silicon Valley". I am immensely thankful to Dorrian Porter at Northern Imagination for the opportunity to sculpt the image of this great man and the 772 Kickstarter backers who made it possible. Terry Guyer Interviewed about the Nikola Tesla Statue on Darlene Carman Presents. We chose to emphasize Tesla’s invention around wireless electricity due to the uniqueness of the invention (now and then). A humble vs. showmanship posture and achieving a likeness to Tesla was the focus. Tesla enjoyed demonstrating wireless electricity involving a wireless bulb in the 1890s. The Tesla Statue is proposed to be situated immediately after the off-ramp of Page Mill Road, one of Palo Alto's busiest streets, leading to California Avenue, which means it will be seen by thousands of passing automobiles and pedestrians every day. The area continues to see increased development for office space, especially for technology start-ups. A concept drawing is produced after a number of idea sketches have been reviewed and a direction decided. A three-dimensional maquette (scale model) is then made in clay. An improved portrait image of Nikola Tesla is made into a highly-detailed full sized clay to be used as the artwork master which will be molded and cast in silicon bronze. The metal casting is done in the lost wax process to preserve all the detail in the original clay artwork. Full sized clay Nikola Tesla in the mold-making room at Artworks Foundry in Berkeley California ready to get it's mold the first step in the lost wax casting process. The seven foot clay sculpture first gets a silicon rubber mold which is reinforced with plaster. The next stage is a new wax original from the silicon mold. Here are the wax pieces prior to the ceramic shell mold. The wax will be burned out of the ceramic shell in a furnace (the lost wax process). Molten bronze will be poured into the space which once held the wax. Molten bronze being poured into the a section of the full-sized Nikola Tesla statue ceramic shell. You can see the statue head, here, cooling after being filled with molten bronze. When it has been thoroughly cooled the ceramic shell will be broken off and the cast bronze will be cleaned, welded together, and chased (retouched with metal tools) to match the artist's original. IT'S ALIVE !! 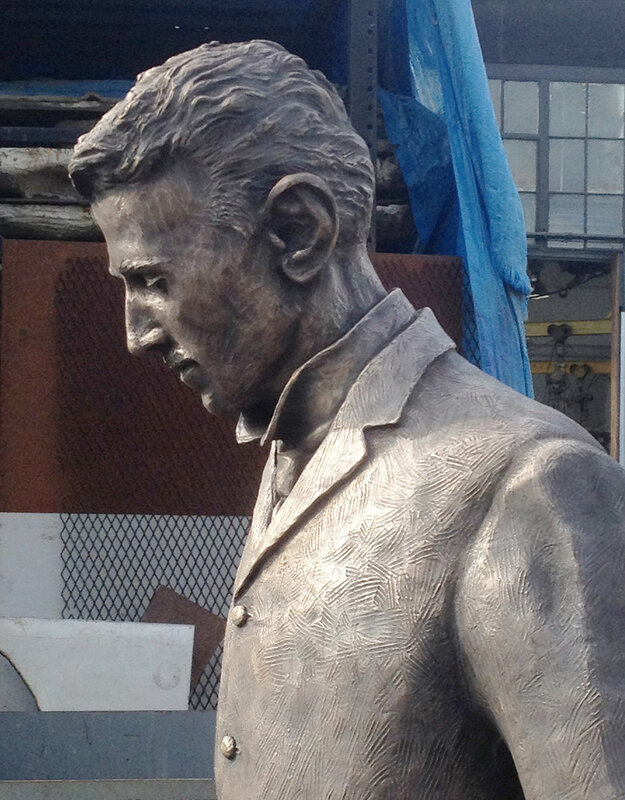 "A Statue of Nikola Tesla in the Silicon Valley" is almost done. Bronze cast in pieces, it is spot welded back together waiting for me to check the accuracy of assembly before final welding and chasing. Delivery and installation in Palo Alto at the Sheridan and Birch Street site. More information on the Kickstarter campaign. Detail of of the Nikola Tesla statue head and shoulders during patina process at Artworks Foundry in Berkeley California. After the unveiling on Birch Street and Sheridan Avenue in Palo Alto, CA December 7, 2013, some groups stayed later to get a close-up view and to check out the list of supporters on the plaque. We had over 100 people at the unveiling and over 250 watching the live-streaming of the event.